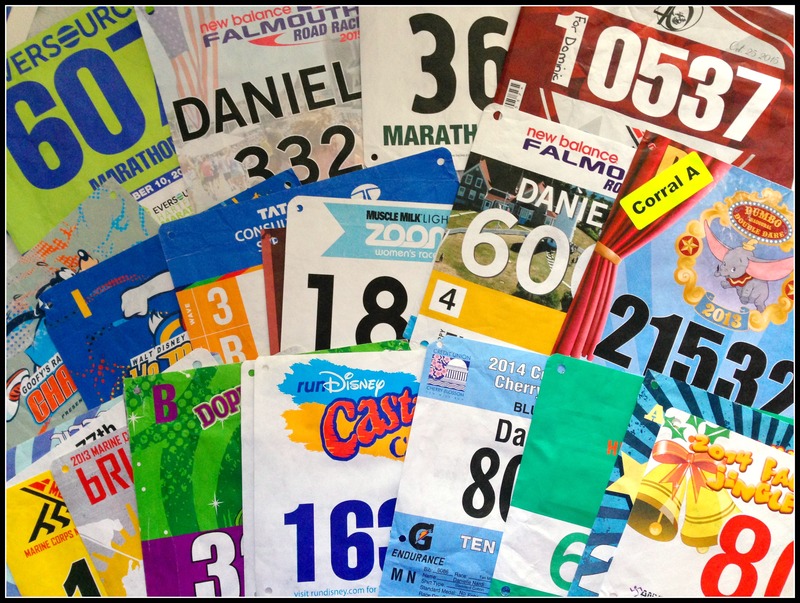 Race Bibs – Trash or Treasure? I’ woke up this morning at the most magical place on earth so I’m off to go play in the parks! I thought I’d just pop in with a quick post/ thought today! 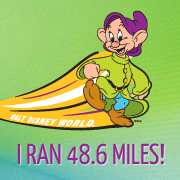 Hope to see some of you at the Wine & Dine Half Marathon this weekend! I love my race bibs. In a way, they’re more sentimental to me than my race medals. The bibs were with me from the starting line and through the whole run. They were my identity over the course of the race. Having recently run a few races I had a small pile of race bibs piling up on my dresser and figured it was about time to add them to the rest of my race bib “collection”. Do YOU keep your race bibs? I’d love to hear any fun/ creative ideas! I do keep them, but I’m not very creative about it. They are in piles or held together by those large paper clips. I try to write my finish time on the back. For generic bibs I write the name and location of the race. I don’t know why I keep them. It’s not like my grand children will oow and aah over them someday like an Olympic medal. Many people toss them and some even give away their medals. Unthinkable! Oh I like the idea of writing your finish times on the back, I think I may go back and do that! And I totally laughed out loud about your grandchildren not oohing and ahhing over them – it’s so true! I mean why the heck do I keep these things?!? Some people have told me they have closets full. Some people rotate many pairs. Many. A lot of people are pack rats and shoes are just one more thing to keep. I donate also. I can’t stand the clutter! I keep the bibs from my big races and I put them in a big poster frame. It’s more a collage pattern within the frame, and I have it at work. It can be a good conversation starter. That’s a good idea! I always love all the different colors and designs of bibs together! I have been keeping mine! I hang them on the wall. Nothing fancy yet, A lot of them look the same, but I’ll write on those ones so I know the race, date, and time. I think I’m going to have to go back and write my times on them, I like that idea! I think I may ask for one of the race bib hangers for Christmas. Do you have one that you’d recommend?? I got mine on etsy from Running on the Wall (similar to this, but you can get different designs: https://www.etsy.com/listing/165575017/triathlon-triathlon-medal-holder). I like it because it holds medals too, but I think they also have ones just for bibs as well.